Inlays/Onlays: Inlays/Onlays are fillings used to fill in decay teeth with a natural aesthetic look and long lasting durability. They are also known as indirect filling and are composed of porcelain or composite materials. The inlays and onlays are crafted in our dental laboratory and are bonded to a decayed tooth. Composite Bonding: Composite bonding is used to rectify chipped, broken, discolored or decayed teeth. We use high quality composite and are applied to the cavity and sculpted into shape and hardened with a cure light. Composite is chosen depending on the shade of the teeth to have the best match to blend invisibly with the bonded tooth to create a bright smile. Teeth Whitening: Teeth whitening are performed on stained or discolored tooth caused by smoking, food, coffee, and tea, red wine or poor oral hygiene. At Ivory dental clinic, we provide in office and at home tooth whitening facilities that can be chosen as per the client requirement. Dental Veneers: Porcelain veneers or laminates are used to repair chips and cracks in the teeth, gaps in the teeth and severe tooth discoloration. Dental Implants: Dental implants are prosthetic tooth root replacements used to compensate tooth loss. Dental implants offer an enhanced smile and more youthful appearance. Dental implants are inserted into the jawbone and topped with a prosthetic tooth to cover the gap caused by missed teeth. The dentist ensures the best match shade of material is used to craft a prosthetic tooth so that they provide a natural look and improves the aesthetic appearance. Smile Makeover: At Ivory dental clinic we offer smile makeovers and customized smile designing process to improve the overall smile appearance. Smile makeover involves a comprehensive evaluation of the smile and performs one or more cosmetic procedures to create a bright and perfect smile. 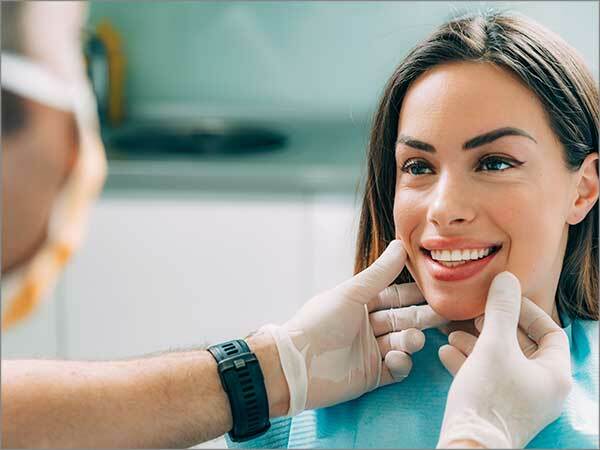 Full mouth reconstruction: Full mouth reconstruction improves the aesthetic appearance of your smile, by performing necessary treatment procedures to rectify functional problems with the bite, muscles, and teeth and bone structure in the face. Gum Contouring: Gum contouring removes gummy smile and reshape the gum line to produce a more beautiful smile. The procedure also involves enamel contouring to shape the natural teeth to improve their appearance and correct smile imperfections. Dental Crowns: A dental crown is crafted from the mold of the original teeth that is decayed or damaged. The decay is removed and prepared and the crown is placed to improve the shape, size, strength, or appearance of the teeth. Braces: Braces are used to correct misaligned and overcrowded teeth by applying steady pressure over time to slowly move teeth into alignment. We also provide invisible braces that are composed of clear, plastic molds to steadily move the teeth into alignment. At Ivory dental clinic we incorporate a variety of dental technologies to showcase the changes that can be expected to see in the smile after the cosmetic dental procedures. We provide a preview of the design and the results through dental imaging software with before and after photos, dental study models and dental composite bonding mockup that serve as a mockup of the cosmetic dental services. We accentuate on excellence and quality in services by a team of well-experienced and qualified dental surgeons at affordable rates. To know more about cosmetic dental services and procedures, book an appointment now.